The Professional Master’s in Applied Systems Engineering program is structured to enable working professionals to learn while maintaining a full-time career. 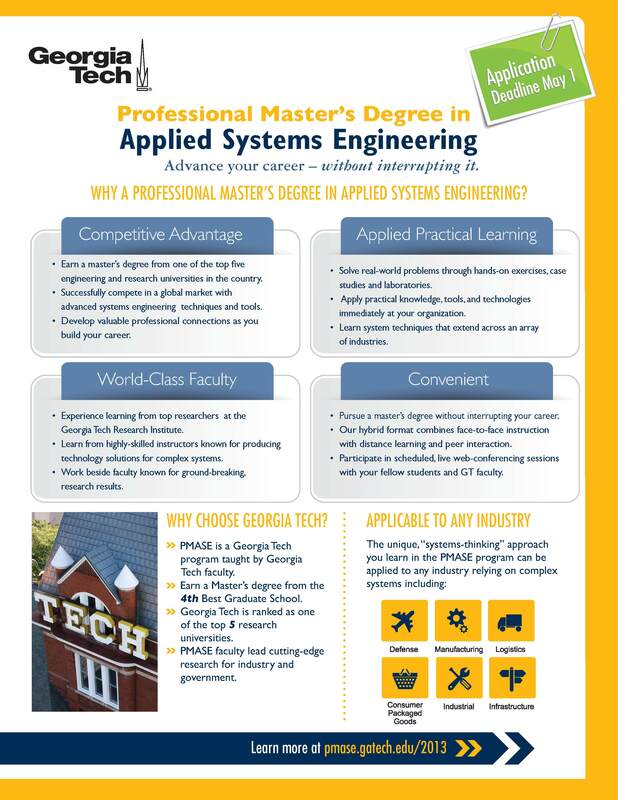 Georgia Tech will host two information sessions regarding its Professional Master’s Degree in Applied Systems Engineering (PMASE) at its Savannah campus on May 7, 2013 at 5 p.m. and 6:30 p.m.
PMASE is a two-year master’s degree program offered by Georgia Tech in collaboration with the Institute’s College of Engineering, the division of Professional Education, and the Georgia Tech Research Institute. 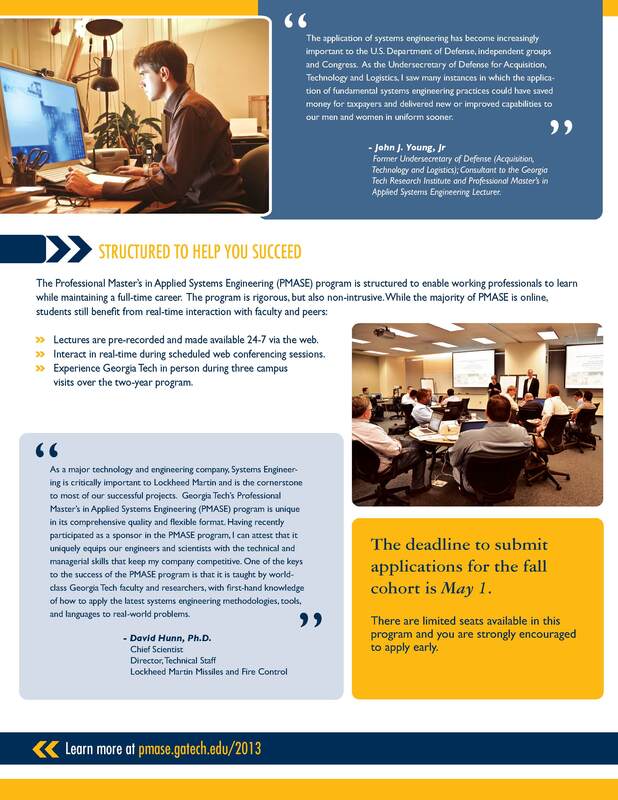 Developed for experienced professionals interested in expanding their systems engineering education, the program provides flexibility for working adults through online and face-to-face instruction. The PMASE curriculum includes six core courses and four courses in a complex systems track sequence. Each course is three semester hours of credit for a total of 30 program hours for completion of the degree. Through a practical, hands-on approach, students will learn how to successfully integrate systems engineering processes to gain a competitive advantage. It is applicable to individuals who work in a variety of industries, which include but are not limited to: defense, manufacturing, logistics, industrial engineering, infrastructure, and consumer packaged goods. First session: 5 - 6 p.m.
Second session: 6:30 - 7:30 p.m.
RSVP: For more information or to register, visit: http://gtpe.gatech.edu/pmase-info-session. For more information about Georgia Tech Professional Education, visit: http://gtpe.gatech.edu/.